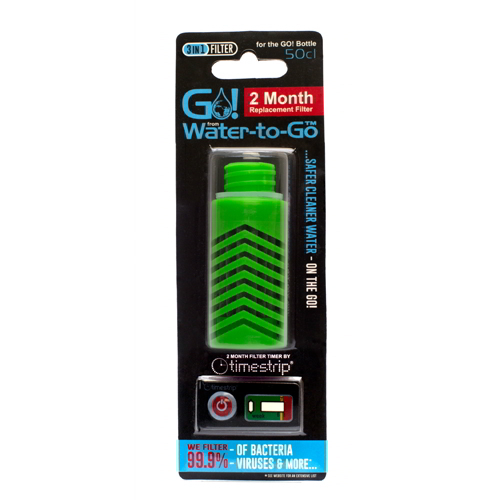 A 3-in-1 water filter that removes 99.99 percent of bacteria, viruses, protozoa, oocysts, heavy metals, and other water impurities. Originally developed for NASA space programs, 50cl Go! Filters are a combination of nano alumina, 33 percent carbon, and various other components. The filter utilizes a charged membrane of pore size of 2 microns to remove water contaminants. The uniquely built water filter medium develops hydrostatic charge to attract and remove negatively charged impurities, providing you with a reliable supply of clean, healthy water. Available in six different colours – red, pink, white, blue, green, and black. The 3-in-1 Go! 50cl filter efficiently removes 99.99 percent of all bacteria, viruses, heavy metals, etc., to offer you safe, healthy water. The filter lasts for 2 months or treats 130 litres of water, and includes a timer that indicates the filter life. The 50cl Go! Filter only functions when damp. On first time use, fill up the bottle and invert it to keep the filter submerged in water for 20 minutes. Once activated, the filter provides you a consistent supply of pure water.